A guide and blueprint to a purposeful millennial existence—and how we can make a difference. What does it mean to be a millennial in this chaotic world? Beyond Snapchat and Tinder, the consumerist culture we’ve inherited, and quarter-life crises, can a millennial aspire to more? With intimate stories, ethnographic research, and practical tips, The Millennial’s Guide to Changing the World will inspire every young person, showing them how to optimize their coming-of-age potential in a world that desperately needs it. 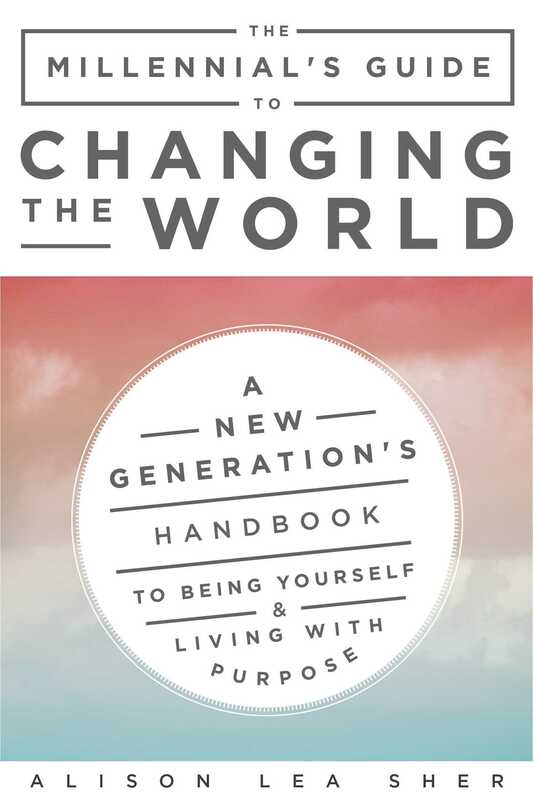 "The Millennial's Guide to Changing the World is heartfelt, discerning, candid, comprehensive, and stubbornly hopeful. It's exactly what we need in a roadmap to the future." Think that went for Buddha too. And any heart that loves & gives, and any eyes that dance. This wonderful book will help. I hope it reaches many." "A very important contribution at exactly the right time. Whether you’re a millennial trying to figure it out, a baby boomer trying to figure them out, or anyone else wanting to be inspired, educated, and entertained, this book is for you. Alison Sher not only does a brilliant job outlining the challenges before us, she also provides keen insight on how we can change our trajectory. From personal empowerment to new generation political action and spiritual expansion, Sher lays out powerful insights and strategies that cross generational boundaries." "Every millennial should read this book. Alison does a great job challenging our generation to become the best versions of themselves. You'll find yourself simultaneously challenged and inspired." "The Millennial's Guide to Changing the World is a manifesto that maps out in thrilling, clear terms how we can—and must—create a culture that includes everyone. This is radical because mass culture has always served the few, leaving the rest of us swimming in cynicism even as we continue to respond to the relentless drumbeat of consumerism. Please, millennials, read this book and take the lead. Please, boomers and Xers, take a millennial by the hand because they are the ones leading us home." "A wise, inclusive, timely invitation for a generation to rise together into their fullest potential for the betterment of themselves and our world. Whether you are a millennial yourself, are the parent of a millennial, or work with millennials, this book is a must-read for you to have a better understanding of what inspires and motivates this influential generation." "This book is an invitation to the best party ever! There’s food everywhere for the brain and soul, and a cast of characters who surprise and delight. Alison Sher invites you into the living room of a millennial brain, and what unfolds from there is pure enchantment. Incredible research, revelatory interviews, and an open door to the zany zeitgeist of millennial culture. Don’t miss it!" "Alison Sher's words are a blueprint for millennials who are ready to release their inventive, creative, spiritual, and economic gifts to create a more loving yet driven society. If you are looking for a catalyst for radical responsibility and change, this is the book." "Funny, engaging, and timely! Written by a millennial for millennials . . . Alison Sher’s insights concerning critical issues for twenty-somethings covers the gamut from money to identity, from tech to politics, and pretty much everything else you need to consider as you successfully navigate the first quarter of your Life. . . . Where was this book when I was coming up?!" "Alison's unique blend of insightful, extraordinary intelligence, compassion, and hilariousness combine to create a force capable of moving mountains. I'd encourage everyone to read this book and believe that, with Alison's roadmap, we can indeed change the world for the better." "Alison describes how the millennial generation can become both dreamers and action-takers. It's funny. It's poignant. It speaks to the core issues and roadblocks that keep our youth from living up to their full potential. It describes exactly how they can overcome these blocks to make the kind of moves that will transform their lives, while making a positive impact on the world." "Alison Sher is a force of nature, which is reflected in every page of this book. It will challenge every preconception we old(er) folks have about millennials and give interested millennials tons of things they could do to take charge of their lives and change a world that my generation has done a good job of screwing up." "Alison is awesome—not only inspiring as a person—but a fabulous, insightful writer and disrupter who will make change happen constructively by helping the rest of us understand and appreciate the unique contributions her generation has to offer for the future of our fragile planet." "I love what Alison has written. . . . Alison has a voice and an opportunity to say something in this coming world, to bridge worlds and expand minds in a way people will listen." “Alison Sher is a force. Her communication is so effortlessly poignant and sharp. She has readers simultaneously laughing to tears and gobsmacked at her impeccable wisdom. Her insights into our social ills and problems, and how the rising generation can uniquely solve them, must be shouted from the rooftops!"